The L.I.S.T. System is based on thirteen building blocks derived from kinesiology, physiology and to a lesser extent, psychology. Please note that these explanations are deliberately brief. It is recommended that you study each topic to develop a greater understanding of each concept. This will help you appreciate your bodys potential, abilities and functions. Our connection to the earth through gravity is one of lifes basic elements. A key mechanism in this relationship is known as the righting reflex. The righting reflex aligns us with gravity and is dependent on multiple simultaneous factors. When our movements are harmonious with the earths gravitational field, our bodies are in balance and our functional performance is maximized. When we are not balanced, too much of our energy is spent on maintaining equilibrium, thus reducing our ability to move efficiently and increasing the likelihood of injury. Gravity is the force that tends to draw all bodies in the earth's sphere toward the center of the earth. Consider the child learning to stand and walk. As the child moves towards vertical, he struggles with balance. Eventually he rights himself and begins to feel a deeper connection with the gravitational force of the earths core. 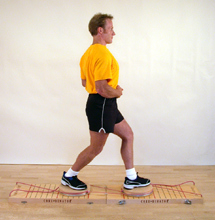 As he attempts the more complex function of walking, he learns through repetition to align an elevated and moving center of gravity, and walking eventually becomes second nature. Similarly, the L.I.S.T. Balance System enhances awareness of our connection to gravity and improves our ability to function. Breathing is one of our most important survival mechanisms, and controlling our respiratory response to stimuli is basic to physical conditioning. Through the simple act of inhaling and exhaling we are undeniably connected to our environment, one which is often stressful. A well-conditioned system will better enable us to respond to stressful situations with composure. Conversely, if our respiratory system is weak or functioning improperly we will not be able to respond effectively, increasing stress and anxiety. The relationship between the respiratory apparatus, core muscles and those muscles related to the spine, make breathing the central mechanism of power and timing. Proper breathing technique is critical for optimal performance. a split second late. The solution is simple: unlock your bodys potential by learning how to breathe. Sequences rotation from the arch of the foot to the core region of the body. If you cant do the time dont do the crime. Incorporating the above restoration work into your schedule can neutralize the negative effects of super intense training and help maintain an extreme level of fitness for extended periods of time. Top athletes rely on rest and regeneration to help maintain extreme levels of performance for many years. It is not unusual to see professional athletes competing into their late 30s and early 40s. For these athletes, rest and regenerative techniques are the key. Their importance becomes apparent to anyone routinely exercising past the age of 35. As a training priority they move to the top of the list with time. Core-dinator (short board configuration with primer board) - destabilized rotation. Improves neuromuscular control. L.I.S.T. Vertical Core Extension (VCE) activation points are those areas in the body which trigger the antigravity muscles. Conscientious activation of these points increases the length of the body and acts as a vertical extension of the core/center. This enhances the primary impulse for movement, the righting reflex. A well-aligned body harmoniously utilizes the forces of gravity. For a body that is out of alignment, the forces of gravity will result in increased compression, causing joint, organ and neural stress. This will cause the body to age prematurely. "The workouts Karl has designed for me, geared to my rowing season, have helped me immensely with my form and strength... In my opinion, there is no better way to fully condition yourself and maximize performance, regardless of your pursuit, than to work with Karl." One of the key purposes of exercising in a destabilized environment is to simulate the demands of real life. In our daily lives, we constantly move in multiple directions while performing any number of complex activities. When we perform these movements our bodies are rarely in total alignment. Through loading (i.e., performing a movement with some form of resistance) in a destabilized environment, we condition our neuromuscular system to perform these functions with greater accuracy, control and stability. Loading includes concentric (shortening phase), eccentric (lengthening phase) and isometric (static) muscle contractions. To illustrate, imagine carrying a small child up or down a flight of stairs. For most people, this is a fairly simple task whose familiarity requires very little concentration. Now lets make each stair a different height and depth to destabilize the environment. What happens? The familiar becomes unfamiliar and the entire dynamic of the task changes. To perform it effectively, we must: (1) visually evaluate each step for height, depth and distance; (2) estimate the amount of physical exertion required to climb the step; (3) maintain our balance to ensure the safety of the child; (4) position our body correctly; and (5) execute the step. This process will be repeated with each step, in varying degrees of concentration, depending on the variance of the step in relation to the one previous. To perform a movement accurately, the motor or contractile units controlling our muscles must fire in sequence. This requires a consistent and timely flow of neural impulses transmitted to the contractile units across the many muscle groups involved in the movement. If a particular movement is unfamiliar, the contractile units will not be prepared to execute the desired movement. Smooth, consistent muscular contractions depend on the health and efficiency of the individual sarcomeres that make up the muscle and contribute to the tension generated throughout a contractile range of motion. The purpose of neuromuscular conditioning in the L.I.S.T. 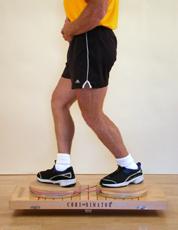 Balance System is to educate these contractile units to optimize the muscle-firing sequence. 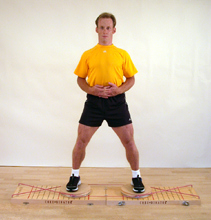 Core-dinator (split platform) - friction-free rotational base-split squat. Improves hip, knee, ankle and core stability. 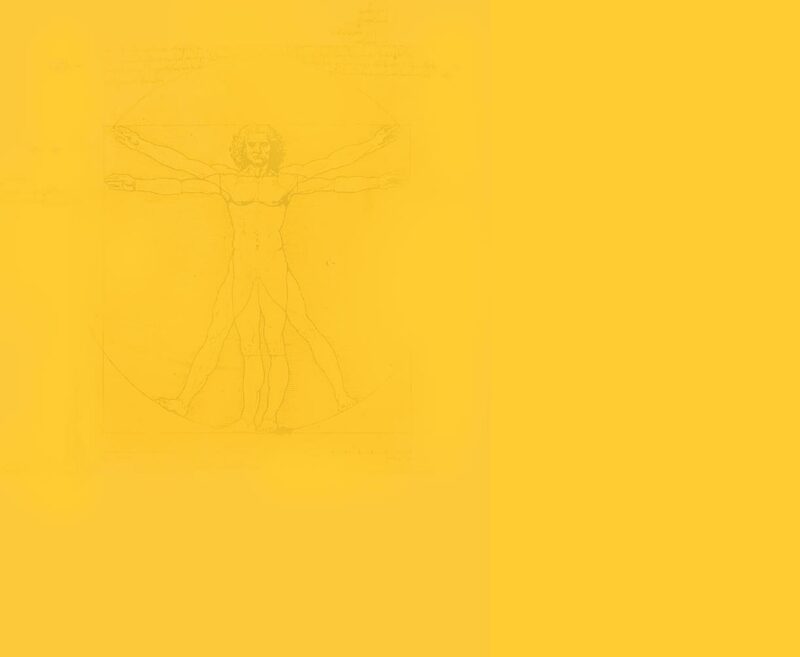 Human beings move in three planes and in various elevations. The frontal plane divides a body into front and back halves and involve movements to or away from the centerline. Movements of adduction and abduction occur in this plane. The sagittal plane runs vertically and divides a body into right and left sides. Movements of flexion and extension occur in the sagittal plane. The transverse plane divides a body through its center into upper and lower parts. Rotation occurs in this plane. Exercises in the L.I.S.T. Balance System integrate multiple planes and changing elevations to condition the body to react effectively to complex movement situations. By developing a more comprehensive understanding of biomechanics, you will improve your training techniques and move with greater efficiency and effectiveness. In all training regimens, joint alignment is critical for performance and the avoidance of injury. In the L.I.S.T. 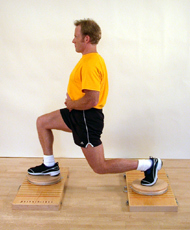 Balance System, joint stability is enhanced by performing exercises on an unstable base of support. During the exercise, any joint that is out of alignment will cause a break in the kinetic chain and either physical discomfort or loss of balance. Stable joint alignment will enable an exercise to be executed through the entire range of motion at its fullest potential. This maintains the kinetic chain and imprints the neuromuscular code of the movement deep into the bodys biomechanical system. Pilates Box - finish position of Superman exercise. Improves full trunk stability. Great for lower abdominal muscles. The best training regimens produce improvements in strength, speed and muscle balance. To improve your neuromuscular capabilities, your training regimen must adjust load (levels of resistance) and/or neural demand to achieve proper technique and improve functionality. Simply stated, once a starting point has been determined, to build strength, speed and muscle balance stimulus must be increased at a consistent rate of progression in the training program. The destabilized environment of the L.I.S.T. Balance System enhances results. The unstable base of support requires significantly greater mental concentration and an expansion of the muscle groups involved in each movement. The L.I.S.T. Balance System produces great results because of the demands placed on the bodys mind and musculature. "Balance activities that integrate the visual, auditory, kinesthetic, tactile and vestibule senses have the effect of improving the proprioceptive processes that help reduce injuries and improve performance." One of the problems with traditional training programs is boredom. How many times have we quit training because it is simply not enjoyable? For a training program to be successful, it must provide an adequate amount of mental and physical challenge that is interesting, positively stimulating and demanding. In the L.I.S.T. Balance System this is accomplished through the addition of balance. Each exercise presents an exciting combination of balance, movement and load (resistance) that will challenge your mental and physical abilities. You will experience firsthand the importance of biomechanics and neuromuscular coordination. As your balance improves, you will begin to feel the difference of a fully functioning neuromuscular system. This is the L.I.S.T. difference. "These are the most innovative pieces of equipment and conditioning techniques I've seen in years. Consistent biomechanical efficiency is critical to achieving greater athletic performance and genuine injury prevention. L.I.S.T. ( List Integrated Systematic Training ) delivers. No serious strength and conditioning program should be without L.I.S.T.! Human beings live in a three-dimensional environment that consists of hundreds of constantly changing variables. In order to develop acute spatial awareness, it is essential that we constantly gather and integrate information from all five of our senses. Through sight, touch, taste, smell and hearing we are able to interpret our surroundings and respond with the appropriate action. Spatial awareness is defined as: (1) an awareness of the bodys position to its immediate surroundings and (2) an awareness of the objects in our immediate surroundings. In everyday life we take these sensory perceptions for granted. For the athlete in training, it is an entirely different scenario: only through intense sensory training can an athlete perform at his or her optimum level of performance. For example, lets take a look at the sensory perceptions of an athlete taking the final shot in a championship basketball game with one second left in the game. The athletes team is down by two points requiring a three-point shot from the arc, or three-point line. First, there is an understanding of the importance of the game. This adds an element of emotional pressure, or stress, to the situation. Second is an awareness of the time remaining in the game creating a sense of urgency. The athlete must take the shot with virtually no time to think. Third, the athlete must be aware of the position of each member of the other team to assess how they are going to defend the shot. Next, the athlete must interpret the distance to the basket. Finally, in the midst of the intensity of cheering and jeering fans, the athlete takes the shot. The athletes body must be in near-perfect alignment if the shot is going to be successful from the three-point line. If the athletes senses are finely tuned, he or she will evaluate all of these variables correctly and make the basket. If not, the athlete will be left with the memories of a championship lost. It is the refinement and integration of the senses that makes the difference between a good and great athlete, between success and failure. The brain plays an integral role in the bodys ability to respond to external stimuli. As the body moves, the brain gathers vast amounts of information from proprioceptors in the muscles, joints and tendons. It processes this information and attempts to align the body and position the joints to accommodate the desired movement. If the athlete has trained his proprioceptive system properly, the brain will receive and interpret the information correctly and the body will respond accordingly. If the athlete has an underdeveloped proprioceptive system, his brain will not interpret the stimuli it is receiving accurately and the body will not respond as effectively as with the finely tuned athlete. The L.I.S.T. Balance System provides the athlete or, you with an opportunity to stimulate the bodys proprioceptive processes through the addition of balance into the exercise regimen. Since each exercise engages significantly more muscle groups and requires greater neuromuscular control, the brain receives significantly greater stimuli from the proprioceptors in the joint, muscles and tendons. As a result, the brain is trained to respond to conditions that traditional training programs do not provide. Ambidexterity represents the single greatest potential for increased athletic performance. Every body has a strong or dominant side, i.e. left-handed or right-handed, and an off hand or weak side. The dominant side will dictate every action of the body. For instance, a right-handed person will naturally bend down and pick things up with their right hand. This repetition creates imbalance in spinal mechanics and muscular habits. Decreasing the disparity between the dominant and weak sides of the body will improve overall neuromuscular harmony and performance. The skilled athlete, who is highly conditioned, is probably using 80% to 90% of their strong-side potential (i.e., coordination and strength). With continued training, they can improve this strong-side performance to 100%. Their weak side, however, is probably functioning somewhere in the neighborhood of 40% to 50% and represents the greatest potential for overall improvement. Lets take a look at a simple overhead press. If the dominant arm is performing at 80% and the weak-side arm at 50%, it is obvious that the athlete is nowhere near peak performance. The press is ultimately limited to the strength of the weak-side arm. The same could be said for functional athletics such as throwing a baseball. The throwing motion of the strong side will be fluid and natural. On the weak side, however, the same exact function will be uncoordinated and unnatural with greatly diminished performance. While a baseball player may never throw with his off hand, working to develop offhand throwing mechanics will greatly improve strong-side performance as the body moves towards neuromuscular balance. Creating total mind-body fitness demands consistent regular stimulation of both sides of the body with a heightened awareness of the weak side. Bringing the body into functional symmetry will: (1) greatly improve strong-side performance as the body moves towards neuromuscular balance; (2) dramatically improve total body coordination; (3) improve balance; and (4) reduce the likelihood of injury. Training the weak side to move towards neuromuscular equality with the dominant side represents the greatest potential for physical improvement and performance.